Members of the Doutta Galla Tennis Club have full full use of the Club’s facilities and the Club invites you to enter tournaments, join in social events and place your name down for day or night competition play. We have 4 types of membership at Doutta Galla – Junior, Student, Adult and Family. All members under the age of 16 are required to be supervised by an adult/guardian whilst at the Club. This is for their own safety and to ensure that club facilities remain in order. To become a Member of the Doutta Galla Tennis Club, please either download a membership form or fill in the Online Form below. Members may apply for a key to access the Club, which is subject to approval by the Committee. A $10 Key Deposit is payable when requesting a key. Keys must be returned to the Club when a Membership is cancelled. 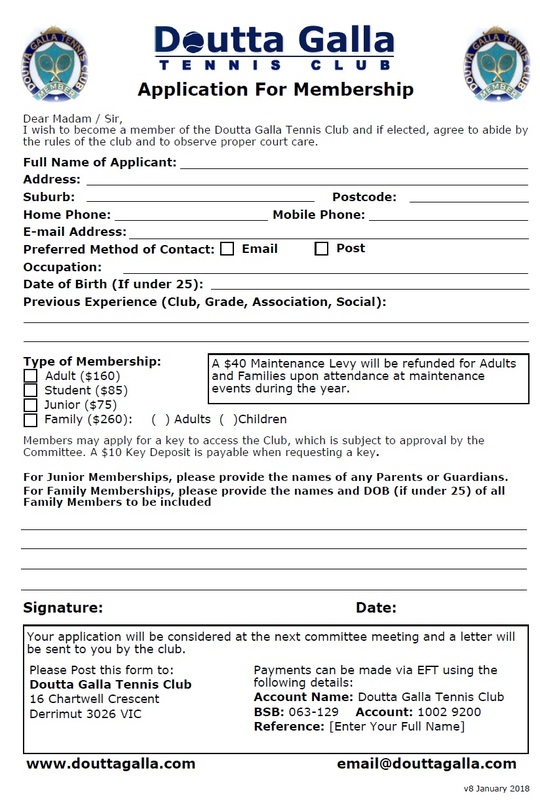 All Adult and Family Memberships are subject to a $30 refund upon attendance and participation in the club’s major working bee that usually occurs in October. Required if applying for a Student or Junior Membership only. For Junior Memberships, please provide the names of any Parents or Guardians. For Family Memberships, please provide the names and Date of Birth (if under 25) of all Family Members to be included.